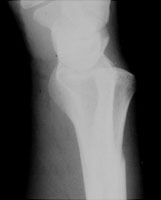 Also called a reverse Monteggia fracture, Galeazzi's fracture consists of a fracture of the radius at the junction of the middle and distal thirds with distal radioulnar joint dislocation. This fracture pattern may be caused by a fall on an outstretched hand or from a direct trauma to the dorsal aspect of the wrist. A Lateral radiograph of the wrist. This shows radioulnar dislocation. B AP radiograph of the wrist. There is a comminuted fracture of the radius with radioulnar joint dislocation.